In unbalanced water, copper may ‘drop out of solution’ and cause staining of a pool’s submerged fixtures and pretty much all of its non-metal surfaces (i.e. vinyl liner, fiberglass bottom, concrete/gunite bottom, etc.). Typically a severe drop in alkalinity and/or pH can result in copper staining with the right amount of free dissolved copper present. In the case where the pool in question has a heater tests for copper in pool water yielding positive results may mean the pool water has become corrosive and has started to eat away at the copper in the heating element(s) in their heater. A second source of copper, and also a good reason to test for copper in pool water every once in a while, has to do with the pool owner’s choice of algaecides. Some of the algaecides on the market contain trace amounts of copper due to copper’s ability to effectively fend off an outbreak of algae in water whose chlorine or other oxidizer level has dropped. Long-term use, or most often improper overuse, of copper-based algaecides can lead to an excessive buildup of copper in the water. A severe change in alkalinity and pH, possibly as a result of a rainstorm or the addition of ‘new’ water to the pool, may cause that copper to ‘come out of solution’ and cause staining on the surfaces mentioned earlier. Does Copper in Pool Water Always Mean Trouble? Absolutely not! In fact, some pools rely on copper as their primary algistat and use very low levels of oxidizers such as chlorine to destroy any organics that do attempt to make the water their new home. 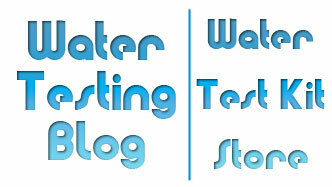 How Can Pool Owners Test for Copper in Pool Water? 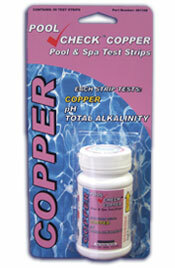 Pool owners can test for the presence of free dissolved copper in their pool water using traditional wet kits, by taking a sample of their pool water into their local pool store for analysis, or by using a test strip such as the Pool CheckTM Copper test strip which detects free dissolved copper levels as low as 0.2ppm and as high as 2.0ppm in under a minute. The Pool CheckTM Copper test strip also tests for pH and Alkalinity at the same time it tests for free dissolved copper residual. 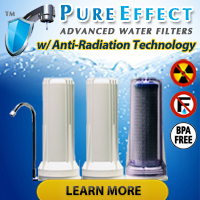 This product tests for pH and Alkalinity because they changes in those two pool water parameters can cause free dissolved copper to come out of solution, settle on surfaces, and stain whatever it lands on — sometimes permanently!